Utilities run under every home and property. Excavating at an unmarked utility can result in injury and property damage. Bullseye follows strict safety protocol, which requires utility identification as part of the project’s scope of work. USA 811, necessary on every excavation project, identifies public utilities. We provide an additional service: confirming USA’s public utility locations with a second set of eyes and identifying all on-site private utilities. When inspecting sewer and storm drains, our technician identifies pipe size, depth, and location, critical information when determining the appropriate grading for new connecting pipes. Electrical lines for lighting and secondary structures, such as garages and guest houses, can wreak havoc on a project. 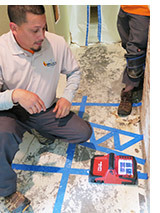 No amount of guesswork can provide the level of reassurance that a professional utility location provides.